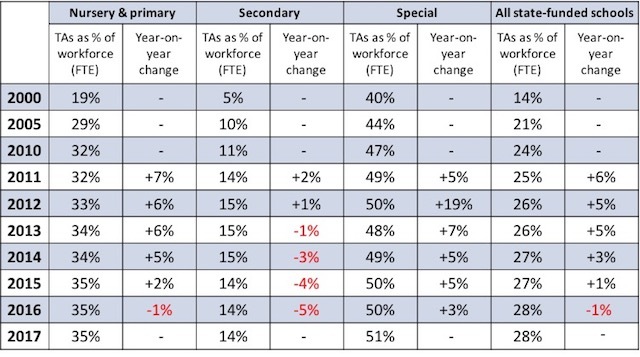 The latest school workforce statistics, released by the Dept for Education, confirm what survey after survey have been telling us for months: schools are losing their TAs. The government started publishing school workforce data 21 years ago. This is the first time the annual count of TAs has been lower than the previous year. The downward trend observed in secondary schools has reached primary and nursery settings – where 67% of England’s TA workforce are based – tipping the overall balance. The table below summarises key stats and trends using data from the latest DfE release, and show how the annual increase in the total TA count has been slowing up as austerity’s jaws clamp harder on school finances. It’s difficult not to see this as anything other than a causal effect. As school workforce data are collected in November, the recent figures reflect the situation some seven months ago. Since then, schools will have made staffing changes in readiness for the forthcoming year. So, given the lag, it’s probable that even fewer TAs will be returning to classrooms in September than these latest statistics suggest. We’ll know for sure in 12 months. It’s worth remarking on the human cost hidden in the numbers. We know from the latest data that schools have lost the equivalent of 2,800 full-time TAs. Yet due to the part-time nature of the role (85% of TAs work part-time), the actual number of individuals affected is more than double this figure. Potentially around 6,600 TAs, predominantly women, lost their jobs last year. In spite of all this, TAs continue to comprise a significant proportion of the school workforce. Across the sectors, 28% of the people working in schools are TAs. On the basis of headcount, England’s TA workforce (381,500) is almost equivalent to the population of the London borough of Croydon (382,300). Yet, somewhat inexplicably, they remain a largely untapped resource and attract vanishingly little attention from policymakers. Over the course of this year, we’ve been running the MITA project: a trial, funded by the Education Endowment Foundation, designed to improve the way TAs are used in classrooms and to ensure they make a valuable contribution to learning. Since September, 60 primary schools across England have been implementing an innovative package of strategic support for school leaders and CPD for TAs and teachers, as part of the largest study of its kind ever conducted in the UK. The levels of engagement and enthusiasm have been consistently high throughout the year. On the basis of the feedback we’ve collected from schools at the end of year one, releasing the latent potential of TAs is demonstrable, achievable and indisputably worthwhile. Schools told us that making TA deployment a focus of attention has raised their profile and considerably lifted both their confidence and sense of value. There are signs too of more effective classroom partnerships with teachers, and small, meaningful changes to TAs’ interactions, consistent with one of the project’s aims of shifting TAs’ talk away from task completion on to developing pupils’ independence. In the face of a potential new trend in declining TA numbers, these observations feel significant. There’s a real risk that the cuts that have forced schools into reducing their TAs is misread as a shorthand for their perceived value. What we’re learning from the participants in our MITA project is that if anything, this, together with challenges presented by a rising pupil population, places an even greater emphasis on schools’ strategic decision-making. As we’ve long argued, ensuring maximum benefit and value from your TA workforce is an essential component of an over-arching strategy to support disadvantaged learners. While we won’t know the results from the MITA project for a little while yet. At the midway point, we can talk only tentatively about impact as participating schools perceive it. Schools will embed practices over 2018/19, before the independent evaluator returns next summer to collect the post-test measures, which will provide the data for a robust impact evaluation. On the basis of this year, however, we’ve seen first-hand how the deliberate act of school leaders making TA deployment and preparation a strategic, whole-school priority can transform perceptions, awaken possibilities, boost esteem and rejuvenate an entire school workforce, as well as prompt positive changes to classroom practice. Perhaps the best news of all is that making this commitment costs virtually nothing. Its effect, however, could be priceless. ‹ How can we get more kids to not hate maths?